Back in the heyday of the Fed's QE, it had become a trader mantra: buy stocks on POMO days, or when the Fed was actively purchasing bonds in the open market, and generate risk-free, outsized returns. It got to the point where even Goldman advised its clients to frontrun the Fed, as we documented back in October 2010, when Goldman's trading desk sent out the following note. Many years later, POMO is long forgotten (at least until Trump forces the Fed to relaunch POMO after the next market crash) and instead of Quantiative Easing we have Quantiative Tightening. But unlike back then, few traders care about days when the Fed's balance sheet shrinks, a form of anti-POMO. 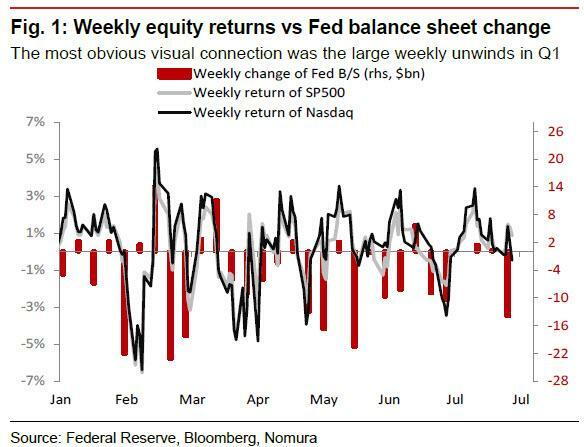 As Nomura's rates strategist George Goncalves writes, "for years macro-mavens the world over would track the size of the Fed’s balance sheet vs equities (notably the SP500 index) to draw the comparison that QE policy was driving stock markets upwards." Fast forward to the present, in the QT world the reduction of the Fed’s balance sheet has not resulted in as clean of an analogy or connection to risk assets, or anti-POMO. Perhaps because no clear correlation has emerged yet: after all, the Fed’s portfolio has already shrunk by roughly $200bn, while the SP500 market capitalization is up over $2trn. To be sure, it’s quite possible that the Fed’s QT has been offset by other major CBs that are still easing. That plus financial engineering (stock buybacks) have eased the drag of QT. However, with the Fed's balance sheet unwind accelerating, it may be just a matter of time before the Fed's liquidity absorption becomes the dominante force in the market. As Goncalves writes, "QT-caps max out in 4Q18 so the jury is still out." So to give a sense of what the underlying market micro-structure dynamics may be, the Nomura rates strategist reviews the recent QT-unwinds as well as market reactions that have occurred on unwind days. Most of the recent weekly declines in the size of Fed’s SOMA holdings have been relatively small. However, as notes that "the largest drop to date happened around the February market correction. October could see another sizeable drop in SOMA, which could point to market volatility around this period." The Fed’s QT-caps - in regards to its reinvestments of MBS and USTs - are set at $16bn and $24bn, respectively in the third quarter. Starting October, the MBS and UST caps move to $20bn and $30bn, respectively and peak at a total $50 billion going forward. We are in the peak period of sizeable reductions. When viewed from afar, the Fed's balance sheet looks as if it’s grinding lower in a linear downward fashion. However, up close we can see that the reductions vary by product and timing of the month, or as Goncalves notes, "we can describe the Fed’s balance sheet as being shrunk in “chunks” at a time." In the chart below, we can see the weekly changes of the Fed’s balance sheet (B/S) vs equity returns. Although the QT-caps have increased over time, the actual biggest weekly B/S decline (over $20bn) took place on 31 Jan 2018, one week before the major equity declines of the year and the historic spike in vol. What was unique about February was that both UST and MBS holdings (Fig 2) declined during the same QT-unwind week. 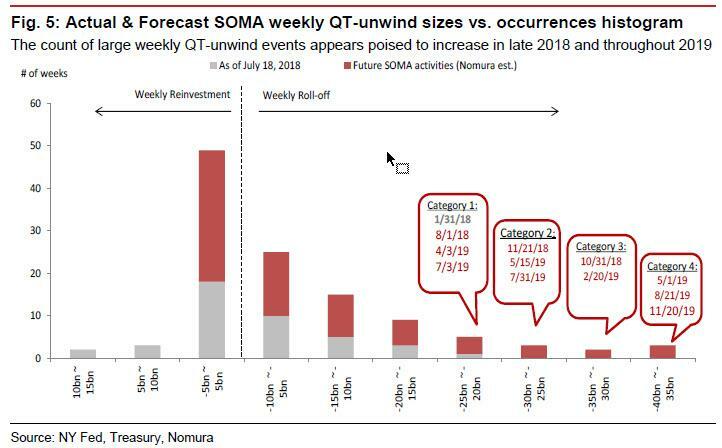 And with larger caps ahead, the likelihood that some of the weekly QT-unwinds are super-sized increases too, according to Nomura. Figs 1 and 2 demonstrate the visual correlation of equity market returns to QT-unwind weeks; however, the most glaring episode was in late January/early February, which saw both the Fed’s MBS and UST shrink over the last weekly period. In late April there was a large UST-only maturity week (nearly $18bn, where data are reflected as of Wed 2 May); however, it barely moved market valuations, whereas in late June there was another UST-only reduction of $18bn (but in that period stocks declined). There were other factors at work then (market concerns over tariffs, etc) so we would not strictly rely on this sort of analysis for gauging future market movements. That said, in Figs 3, 4 and 6 we highlight that when there is a MBS or MBS/UST QT-unwind week, those periods on average see larger moves, in particular to the downside for broader risk assets. And while there does appear to be some "signal" when looking at past correlations between Fed unwind and market returns, as a result of the "noisy" changing size of the unwinds, it is difficult to reach a specific conclusion. Still, the inference that the market is extra jittery on days when the Fed yanks tens of billions in liquidity is intuitive and a logical extension of the "POMO effect." So how is this information actionable? Simple: if one knows on what days the Fed will be rolling-off substantial amounts of debt, one can bet on a downward drift in risk assets as a result of the liquidity shrinkage. To facilitate this, Nomura has counted the total number of weekly reinvestment and roll-off periods that have transpired and are still projected to occur ahead, where it counts the number of occurrences based total balance sheet size changes (as seen from the chart, they are still reinvesting sizeable amounts). The first observation is that the majority of the weekly changes, or anti-POMOs, are sized between positive $5bn to negative $10bn. The second key finding is that there has only been one week of greater than $20bn reduction thus far - just days before the February VIXtermination event that sent the S&P on the verge of a 10% correction. However, looking ahead there are more than 11 occurrences that are even larger. In other words, on days when the Fed removes sizable amounts of liquidity: $20BN or more, there is a distinct possibility that the market reaction would be similar to what was observed on February 5. 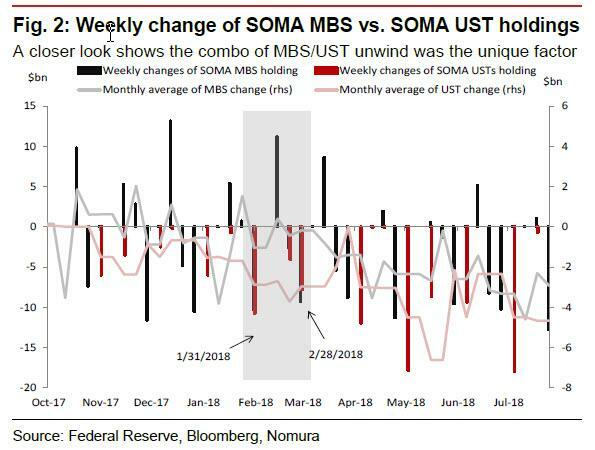 "given there has only been a handful of key SOMA QT-unwind weeks that have led to market corrections, we cannot definitively state that SOMA swings will always lead to market sways." Well, maybe not always, but certainly on days when there is a substantial weekly roll-off, the risks grow significantly. And, here we get to the punchline, because according to Goncalves, the next large QT-weekly reduction ironically enough is happening smack in the middle of this action-packed week, when on 1 Aug the Fed’s UST holdings will decline by $24bn, the same day that the Fed's announcement may exacerbate already shrunken liquidity conditions, and add to the market's fragility. Then again, maybe nothing happens tomorrow, and stocks will somehow manage to levitate, either on a short squeeze or after Powell surprises to the dovish side. Which is why, Goncalves notes that if markets do come under pressure, it would be easy to dismiss this occurrence. 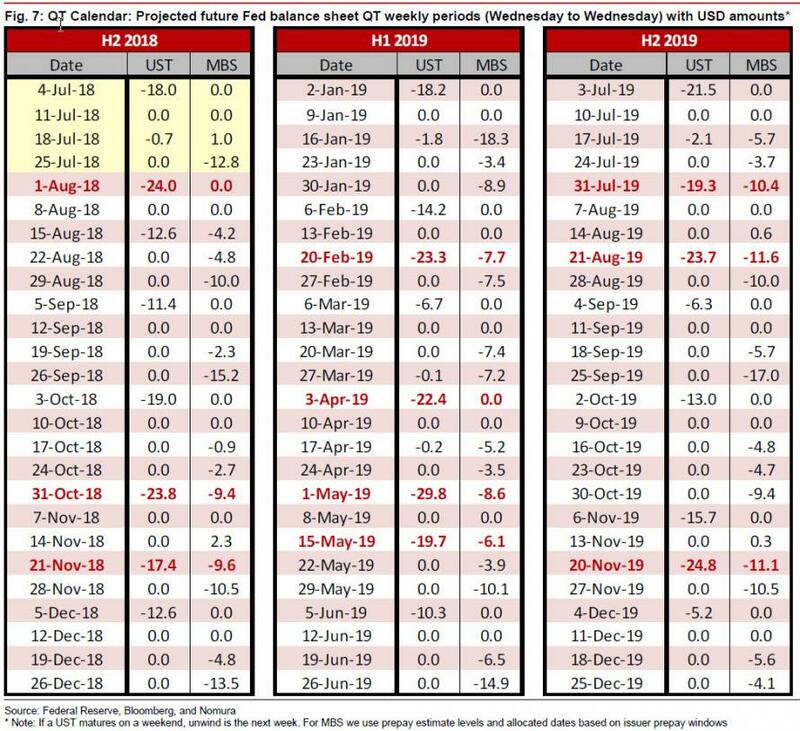 However, things get more exciting later on in the year, especially since as Nomura writes, "our findings show that the more important QT-weeks are when both UST and MBS roll-off. That happens to be in a category 3 week, concluding during the week of 31 Oct."
If Nomura is correct, and a market "event" occurs then, it would come at a very unpleasant time for Donald Trump: just as the BEA announces Q3 GDP which, by most estimates, will be a sharp drop from the stellar Q2 print, but more importantly, a Fed-orchestrated crash would happen just days before the midterm elections. And it Trump needed a reason to launch all out war against the Fed - something he has already hinted at on several occasions - the GOP losing control over Congress as a result of what Trump may come to see as a Fed action, will assure that the war Fed between Trump and Powell escalates into a bloody, deadly spectacle the likes of which have never been seen before. For reference, here is Fed's complete QT calendar until the end of the 2019.